Dig with precision and ease with the Terramite® T5C Compact Tractor Loader Backhoe. Versatility is the name of the T5C. This machine is powerful enough to take on big machine jobs such as loading, spreading, septic tank installations, water, sewer and gas lines and much more. The T5C has a sloped hood for increased loader visibility. Its operator compartment is ergonomically improved. The work lights are positioned at the top of the case enabling better illumination at night. 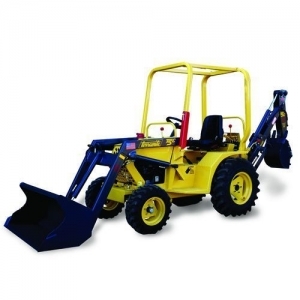 Standard to the T5C is a landscape loader bucket. This model is a profit maker and a money saver for utility companies, contractors, cemeteries and municipalities. Go dig a hole with the Terramite® T5C Compact Tractor Loader Backhoe. Rear bucket dump height: 76"
Front tire to front bucket: 51"